WF: Thank you for your commitment to this interview. JS: My pleasure. I love talking about myself. WF: You appeared at wXw several times and surely will be there again. With this interview we’d like to further introduce you to the fans. Did Edge and John Cena’s father really make you become a fan? JS: I was scrolling through TV channels in the summer of 2006 and i stumbled upon Monday Night Raw. The first segment i watched was the one where Edge slapped John Cena’s dad in his own home. I watched the rest of Raw and followed the story until their match at SummerSlam. Since then i have been obsessed with Pro Wrestling. WF: Please tell us *how a star was born*, who trained you and did you do or play other sports? JS: I was trained in Bedford, TX at MPX by Steven Kirby. I played baseball my whole life. Earned a baseball scholarship to South Dakota State University where i won all conference and all american awards and setting school records. Attempted to play professional baseball but it didn’t work out. So i moved back home, took an 8 week acting course and began my wrestling training in January of 2015. WF: In addition you attended some seminars done by big names, which names would that be? JS: I have attended seminars by Rodney Mack, PJ Black, Vader, Michael Tarver, Caprice Coleman, Evolve (Drew Gulak), Steve Corino, Dr. Tom Prichard (2), Chris Hero, Jerry Lynn, Ron Simmons, Zack Sabre Jr, Shelton Benjamin, Danny Cage, Rudy Boy Gonzalez, Bad Bones John Klinger (2), Walter, Harley Race Wrestling Camp, Ring of Honor Tryout/Seminar and WWN Seminar/Tryout. WF: How useful are those seminars? Do you actually learn something new or is it basics with different trainers? JS: Some are more useful then others. It depends on the seminar and who’s running it but i think you can learn at least one thing from everyone. Each person has their own perspective and its interesting to hear what those are. I have taken all the information from all those seminars to create my own perspective and it has made a big difference in my career. WF: Did or do you have idols – active wrestlers or hall of famers? JS: Once i found wrestling i bought every single DVD i could get my hands on (Its a lot easier now with the Network). The Rock, Rick Rude and Rick Martel are my all time favorites and have influenced my style and character the most. Active wrestlers that i look up to are The Miz, Boddy Roode and Aj Styles. WF: In Germany you attracted our attention at wXw. How was working with Buff Bagwell – what was his feedback on your promos relating to the match? JS: Working with Buff was awesome. Buff is a really good dude and was a blast to be in the ring with. Buff thought all the stuff i did relating to the match was great. He actually did bless me with the top hat which was pretty cool. WF: How did you get to wXw, who contacted you and does it match your expectations so far? WF: Is there a difference between the crowd in the US and germany? JS: There is a little difference. There is more chants and singing in Europe. Crowds are more fun here. WF: You seem to be an entertainer through and through, how important is it for you not just to wrestle but entertain the people, are you a jester? JS: The guys i looked up to were the full package in my opinion. So thats what i strive to be. In baseball its called a 5 tool player and thats what i want to in pro wrestling. The entertainment aspect is really important because it allows people to connect with who you are as a performer. I don’t think I’m a jester because i do get serious when I’m in a fight. WF: Let´s say you were given the chance to wrestle against one or more of your childhood heroes, who would that be and why? JS:I would love to wrestle The Rock or be in one of his movies. I think our styles would mesh well and we would have some amazing promos together. WF: Your debut was as a participant in a battle royal. How do you recall that moment and your first steps in the ring in front of an audience? JS: I was very nervous for sure. I was only in there for about 5 minutes. The next day on September 5th, 2015 I made my singles debut and that was nerve racking. But once i got out there and saw the crowd and felt my adrenaline pumped i new i was where i should be. WF: Did you have matches that will always stay a highlight for you? JS: My first real big singles match was against Ray Rowe and that will always be a highlight for me. My former tag partner went down with and injury so i wrestled singles against Ray and proved to a lot of people that i was going to be a star. And of course my match with Buff will always be something i remember. WF: You are on the road a lot and will also be with wXw in June. How do you like Germany and wrestling here? JS: I love wXw and wrestling in Germany. It has been a really good platform for me to grow and get better as a wrestler and performer. WF: Is the wrestling scene in the U.S. somehow comparable to ours? JS: It is very comparable. Some subtle differences but if you know how to wrestle you can do it anywhere with anyone. WF: Do you think there is a wrestling boom happening? JS: 100%. The indie scene is the hottest it has ever been. Its so competitive which makes it really hot. WF: A tryout with RoH must be awesome, will we see you there any time soon? JS: ROH gave me really good feedback. Not sure what the future holds but I’m sure i will be on a stage like that soon. 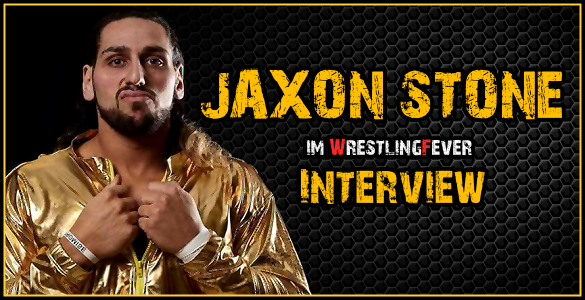 WF: Is the independent scene what makes Jaxon Stone happy or is it your goal, wish and dream to play in one of the *big leagues* one day? JS: Short term goal: be a worldwide name that everyone wants to see wrestle and wrestle against. My ultimate goal is to Main Event Wrestlemania as many times as possible. But my focus right now is getting better, growing the Jaxon Stone brand and becoming someone that people want to see wrestle all over the world. WF: Do you have a favourite opponent, someone with whom you have the right chemistry to work with? WF: We thank you for your time! JS: Thank you! Follow Jaxon Stone on Social Media!